First off, thanks for all the well wishes last week! Everything is all better now (thank goodness!) and we really appreciated your kind words and tips! Soooo…our family has some news. We are moving to San Diego in January! Nate has a great job opportunity in San Diego so we are moving back! We are really going to miss the Bay Area terribly, but it’s fun to move to a place we love and know well. For the next month or so we are going to try to use up food in the freezer, so there may be some random stuff on the weekly menus! You know the drill…please post your menu for the week, no matter how small or big, plain or fancy! congrats on your move our friends just moved there over the summer. 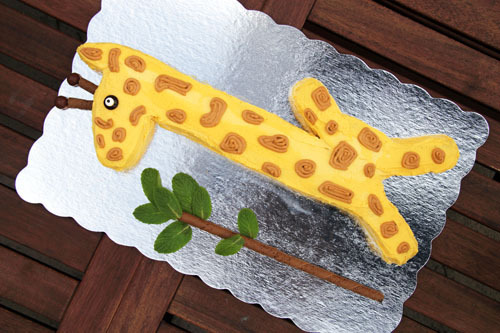 Love love love the cake, I’m a giraffe fan. Shame I don’t have kids to make one for, maybe one day. And good luck with the move! Good luck to you and our family!! Congrats!!! S – family party lots of yummy treats!!! Friday: Meatloaf or Meatballs or something meaty”¦ha! Wave as you drive by Camarillo, if you take the 101 to San Diego, we are between Santa Barbara and LA. Friday, Sat…hmmm, don’t know, kids coming home from college, parade of lights at the harbor, guitar concerts……we shall see. Our last week before the crazies of the holidays begin! It’s been a long time since I’ve posted my menu but I need to get myself on track during this busy time of year! Congrats to you and your family and best of luck with the move. Saturday – whatever’s leftover from our daughter’s birthday party at noon. I am having a tough time deciding what to make! Any suggestions for party food? There will be mostly adults and a few (probably 3) kids. She has requested PB&Js but I need something suitable for the adults to eat! Will be serving approx. 15 people. For your party you could pick up some fried chicken and make a pasta salad and fruit salad. Good luck with your party! Saturday: Chili- get the tree! Congrats on the move! and the new job! bacon… er, pancakes and eggs i mean. Mon- Pork Roulade, leftover veggies from last night….cake. Sun- Frito chili pie….with all the fixings and apple pie. Here is our menu for the week in Bloomington, IN! Wednesday – out for Chinese! Friday – Holiday Date Night! Last week of planning the menu – my mom gets in town next week, so who knows what we’ll cook up together! Or not! Tue. – Sausage, potato, onion, pepper skillet. Fri. – Cookie exchange and appetizer party for me, the guys will be having breakfast biscuits. Sat. – No cooking, so probably out for dinner. I love Cate’s cake. Adorable! I need an easy week. I love having to clean out my freezer or pantry because it gets me to be creative! Tues – hockey award night for my 5 yr old, pizza party! Having a Holiday Playdate at our house on this afternoon also! It’s a potluck lunch and I’ll be contributing mini sandwiches (turkey, brie, & cranberry relish for mamas and turkey & American cheese for kiddos), veg platter, and Christmas cookies for decorating. We’re making reindeer cookies with chocolate-covered pretzels for antlers…so cute! We are going to the SD Zoo Holiday Show on this night, so we’ll be eating dinner out afterwards.